These digital photos may be viewed and selected on the spot! We provide various packages that can be altered according to your needs: colour, black and white, antique, other individual shades. There are 24 available shades of background for the colour pictures. Prices include travel expenses, mobile studio transport costs, expenses for retouching, and two CD copies containing all the photos. 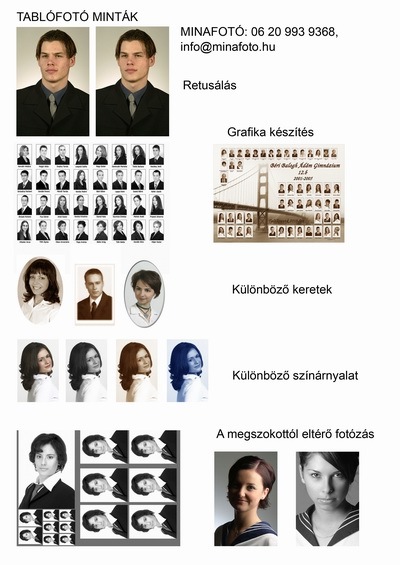 Két osztály megrendelése esetén 5%, három osztály megrendelése esetén 10%, négy osztály megrendelése esetén pedig 15% engedmény!